It is an organization composed of mini-businesses administered by and made up of women dedicated to the production of high-quality handmade fabrics. Each of these self-administered businesses can count on a guaranteed market thanks to the commercial administration provided by Yelka Maric, the organization’s administrator and principal entrepreneur. Madres & Artesanas Tex has specialized in handmade production methods such as macramé, crochet, and other varied knitting styles. The perfecting of these skills is enabling these women to reach New York’s most exclusive markets and runways. 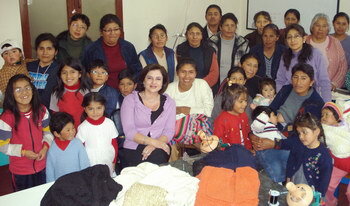 The articles produced today by this successful organization include dresses, coats, sweaters, ponchos, purses and even jewelry made from woven wire. This involves mini-businesses that employ up to 200 craftswomen during the high season. The work model requires an in-house training period which runs until a prototype, in complete compliance with the quality demands of this market, is obtained. Each mini-business is led by a businesswoman who guides, teaches and supervises all the processes used in producing the assigned articles. Under strict quality-control, the finished product is returned to the company center for exportation to the U.S.